Sellsy allows you to easily manages variations by product. You can, from a product, create variants. Variations are fully customizable in your Sellsy account. They can have different sizes, colors, shapes, and much more. (Note: Sellsy allows you to add up to three variants for a given product e.g. size, color, and shape). To start using variations, you must first create them. To do this, click on Items in the main menu and click on Variations. This leads you to the Change Management page. To add a range, click on Add variation. Important: if you want to manage your inventory of products with variants, it is imperative to enable inventory management ONLY AFTER creating the variations. In the pop-up window, enter a name for your variant. Then click Add Value. Enter the requested information and then enter the following value. 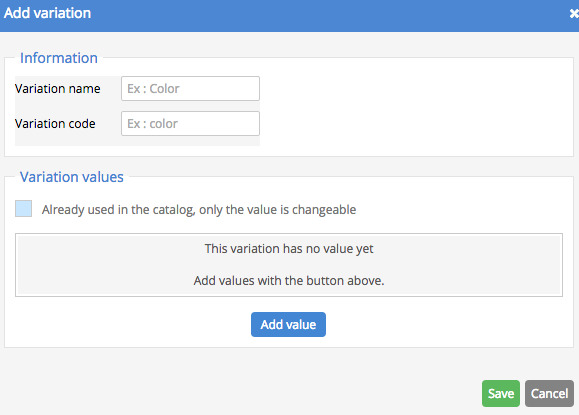 Note: The code value is used to easily identify variations in your products via the API. Enter a single and unique value, and if possible, a mnemonic. Remember, once a change is used in a product, the code value is no longer editable. Your variaiton is now created. Let's now see how to use it on a product. Open the page of the product you want to enable changes in. Then, click the Enable Changes button. 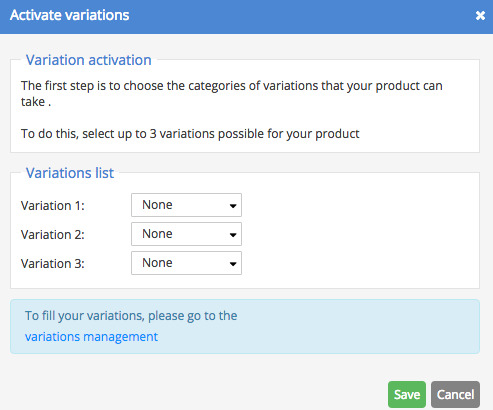 In the next window, you can choose all feasible variants for the product. The page reloads and as you can see, your product is displayed with a Variant indicator. A new panel appears with variation details. At this course, it is void of any variant. Click Manage variations. 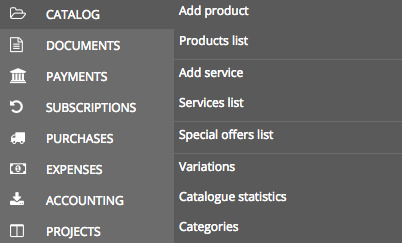 In the next window, you can add all the combinations you need for the product. When you click Save , the changes are Displayed on the product page. At this point, each version of the product will appear in your product Sellsy account. The default values of the product are only now used to define the settings for new variants that you wish to have available for products in the future. Each variant has its own product page accessible via the View button to the right of the variant. This allows you to easily manage various elements based on variations such as product images, description, or barcodes. All elements are managed exactly like a single product.